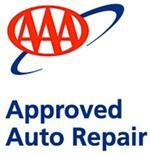 Bill’s Auto is proud to be AAA approved for Auto repair. This requires meeting strict standards for facility, equipment, warranty, and trained & certified technicians. Most important for you is when they surveyed our clients about their service experiences they were greeted with an overwhelming 99.1% satisfaction rating, with 100% saying they would recommend us to their friends for service. Now that speaks for itself! You will benefit from the area’s best equipped facility, so all your needed services can be performed at one location. Servicing all makes and models, and designed for your convenience and complete satisfaction. It is all done right here and you can be assured it is done right.